My wife was recently using her tablet and I asked if she’d replied to an important email. She promptly put down the tablet and reached for her laptop. “Why not your tablet?” I quizzed. She gave me her best “Are you kidding?” face, saying in total deadpan, “I have work to do here”. My wife loves her tablet and uses it nearly every day but she clearly reaches for her laptop for ‘serious tasks’. While most of us can likely agree that mobile is the future of computing, something very interesting is happening here. In a world where new technologies usurp the old nearly every year, many of us are reaching for our old school laptops surprisingly often. This isn’t just nostalgia, there is something deeply inadequate about mobile. This post is about figuring out how to fix it. It’s common wisdom that a when a new compute paradigm emerges, it quickly replaces the old. Minicomputers replaced mainframes, which were, in turn, replaced by workstations, and then desktops. It’s a never ending cascade of the new eating the old. Mobile is the obvious next step in this chain. Yet this time, the flow of dominance is stutter stepping. Of course, desktop computers (and laptops as well) aren’t the huge growth industry they once were but they’re hardly going the way of the mainframe, minicomputer or workstation. It’s important to remember that back in 2010 it was obvious to most that tablets would revolutionize business. I worked at a company that had “Tablet Tuesdays”: we were all encouraged to use only our phones or tablets throughout the day. Of course, that didn’t last long, most of us are now back to using laptops. Schools, which started off giddy over the possibility of iPad, are now moving to laptops instead. To confuse matters, while mobile phone sales continue to grow, tablets sales have plateaued and even started to fall. What’s going on? It helps to understand how a new technology displaces an old. The great business book, Innovator’s Dilemma, explores this topic in detail, showing how a new technology is usually ignored by the incumbent players. The problem is that, at least at first, the new tech just isn’t a good replacement for existing customers. Instead, the tech finds a new under appreciated market. However, as this new market grows, the upstart tech matures and becomes equally good at the old market as well, thus consuming everything. The book uses Seagate hard drives as an example of this effect. In 1980, their new 5.25″ drives were far too small in capacity for minicomputers, the dominant computing platform at that time. The incumbent drive makers dismissed them out of hand. However, these new drives were saved by the exploding desktop PC market, which needed smaller, less power hungry drives. But, within a decade, these new drives quickly improved in capacity and surpassed the minicomputer drives. Seagate went on to displace much of the original drive makers in addition to dominating the huge desktop PC market. This shows how a new technology initially thrives in an underappreciated market. Once it takes off, it then matures to the point where it can go after the original old market as well. I’ll call these two steps to market dominance the New Market Effect and the Old Market Effect. In the case with mobile technology, the New Market Effect has definitely occurred, around the consumption style categories of games, social apps, and news. Smartphones could do what desktops couldn’t: post photos while on vacation, kill time waiting in line, or quickly post an update while breezing through the airport. The New Market Effect for mobile was a collection of entirely new use cases that the desktop/laptop market just didn’t care about. So the New Market Effect has clearly happened with mobile, growing in new ways that desktop can’t touch (my favorite example being games for cats). The problem is that too many people conflate this new and old market effect. They assume that as mobile is growing into new markets, especially developing countries, it’s therefore a given that it will eat the old market as well. My wife didn’t reach for her laptop out of nostalgia. The fundamental UX depth of the desktop UX gave her the expressive power her tablet lacked. The old market effect isn’t happening to desktop (at least not yet) for the simple reason that mobile hasn’t matured enough to replace it. But please, let’s try to avoid a Twitter-esque shouting match, hurling examples of people composing email or presenting slides on tablets. Of course these exist but as I stated before, they are the exceptions that prove the rule. While there are people that have composed entire novels on mobile phones, these people are more like Olympic athletes: we marvel at what they can do but we have no illusions that we would be able to do it ourselves. Most businesses still use desktops/laptops for the simple reason that people get more work done on them. If you complain that ‘business use’ no longer matters, you’re just confusing the new and old market effect. I’m NOT saying desktop will beat mobile. I’m also not saying we’ll have desktop forever. I’m trying to have a nuanced discussion about the UX differences between desktop and mobile and what that means. Mobile phones only use a single window at a time. It is a brilliant simplification, allowing users to simply ignore a host of visual and intellectual clutter that comes with desktop windowing systems. For basic Youtube and gaming tasks, these seem a perfect compromise. However, once you start to create content and want to copy and paste between documents, or compare two drafts, it’s clear that there is quite a bit of expressive power that is lost by this. The problem is magnified when you have a larger screens. As tablets grow to be as large as desktop displays, this simplification starts to feel like a huge limitation. Files, for the most part are completely invisible for most mobile apps. The user’s data is literally hidden within the app itself, with each having its own UX technique for showing that data. This too is a reasonable simplification and works well for smaller problems like saved games and top videos. But as soon as you have dozens of objects, or want to place, for example, images in emails, or even want to use two apps to edit the same object, these initial simplifications start to hold users back. There is no question that the full blown classic desktop folder metaphor is a bit overkill for mobile devices. But by limiting mobile UX to the app-as-container model, mobile apps are hit with a double whammy: you can’t access your content with multiple apps and you can’t take advantage of cloud storage. But Scott, no one cares! Ouch, that was a bit harsh, but I do hear you… Why should we care about a few dusty business folks that want to write some stupid slides? Tablets already have physical keyboards and most people feel this ‘solves’ any lingering input issues. But creating long-form text is so much more that just typing. You need to also select and edit it. But mobile UX does many little things to support a soft keyboard such as auto complete, alternative word choices and popup menus when the user taps within text. While helpful, these little functions have a cumulative negative effect. On the desktop when you click in text it does one thing, move the cursor. On mobile UX, it’s a multiplexed beast of options. It’s no wonder something as basic as selecting a word or placing the cursor so much more difficult. Just admitting this ‘multiplexing’ effect goes a long way in helping us understand these issues, rethinking default tap actions, so we could keep the core tap to move the cursor behavior more predictable. Along the same lines, if we could get a bit more expressive with tapping, it might give us a bit more UX nuance and let us reclaim that basic cursor placement of the desktop UX. Currently, force touch is used as a glorified right click for apps. It could be used in much more subtle ways. For example, to aid in text selection or offer those helper functions listed above less intrusively. Copy and paste is a fundamental utility and is far too hard on mobile today. 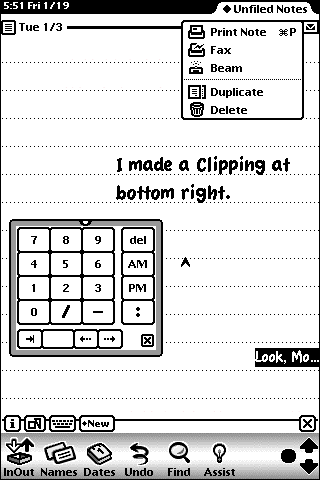 Copy and Paste was always parked in the Edit menu on desktop, with shortcut keys always at the ready. Mobile has no menus or shortcut keys so is forced to inelegantly sneak it in, usually as a pop up menu when the user may not want it. The first step is in admitting that this is a UX hack and then find better, more productive solutions. One direction may be to place a copy/paste button on the keyboard.We also shouldn’t forget our past. The visual clipboard of the Newton has a huge value in that it made the clipboard visible to the user so it was easy to not only glimpse what was in the clipboard, but it created a new control surface to tap on and then drag into the target area. Often when typing, you just need to go back a few characters to make an edit. It would be much simpler to have some type of simple arrow key functionality on the keyboard. There are some clever ideas already out there, involving swiping that turns the keyboard into a temporary trackpad for cursor movement. Given that we’ve already explored gestures on keyboards, there is a lot that could be done here. The iPad pro and Windows Surface are already experimenting with a limited two window mode. Power users love it. We need to keep exploring and pushing on this approach, especially as tablet sizes get larger. This isn’t just for moving data between windows but the simple need to view more ‘stuff’ at once. Two window mode with sliding dividers is a simple extension but as tablets get bigger, allowing more that 2 should also be an option. Exposing app data as accessible files almost feels like a digital right. Users have the right to open file formats that can be seen and modified by others. The obviously valuable use case here is photos. Most apps simply need read access (e.g. to insert a photo) but others need to modify. There are risks with this of course but it allows a more open, almost tinker toy like approach to using applications. Note that we don’t need to go back to the full desktop folder system in order to achieve this. A simple dropbox like folder of user content, available from any app would be a great start. A related point is that by allowing app data to be exposed as a simple file system, you can now move these files into the cloud. Now that we all have more than 1 device, the ability for the apps on each device to have access to the same files is a huge simplification. I take this for granted on my desktop but it a nearly impenetrable wall for most of my mobile apps today. We can clearly make this happen as it hardly involves any additional user complexity. Mobile isn’t killing desktop in the way most of us expected it to. It is clearly the future growth platform of computing (at least, until the next thing comes along) but we have over-hyped the New Market Effect, focusing on ‘the shiny’ and not paying attention to critical MicroInteractions that make a difference. We are so in love with flashy UX features that we ignore the deep impact of the proven and the mundane. The directions listed here are too easily ignored. They are actually the core building blocks of powerful UX experiences and need to be improved. It’s just a bit surprising that so much mobile inspiration can come from it’s ‘inferior’ predecessor, the Desktop UX.